We have a huge selection of video game consoles along with eighties and nineties home computers. The display is fully interactive with all of the machines available to use by the attendees. Each machine has an information panel next to it giving details of the date it was launched and some facts about the machine. The timeline display can start from 1977 with the first tennis consoles and the iconic Atari 2600 video game console. From there it can include great machines like the Commodore PET, Acorn BBC Micro, Sinclair ZX Spectrum, Commodore 64, Sega Master System, Nintendo NES, PC Engine, Sega Megadrive, Nintendo SNES, Sony Playstation, Atari Jaguar, Nintendo N64, Microsoft Xbox and Nintendo Gamecube. The above list is not exhaustive, but is a great starting point, documenting the history of video gaming from 1977 to 2002. However, we can create a display that comes right up to date with the latest consoles if required. The games can feature classics like Space Invaders, Pong, Asteroids, Pac Man, Centipede, Chuckie Egg, Jet Pac, Dropzone, Super Mario Brothers, Sonic the Hedgehog, Mario Kart, Goldeneye, Ridge Racer, Tempest 2000 and many more. We often bring a whole host of additional games available to play. There will be something for everyone! We will bring all of the TV's and monitors required and all of the electrical distribution. All machines and cables are PAT tested prior to the event for safety. A risk assesment can be supplied as well as our public liability insurance certificate. The set-up will include one member of our staff to ensure the consoles and computers remain working at all times. Our staff are also very knowledgeable and are very happy to chat to your guests about the display. 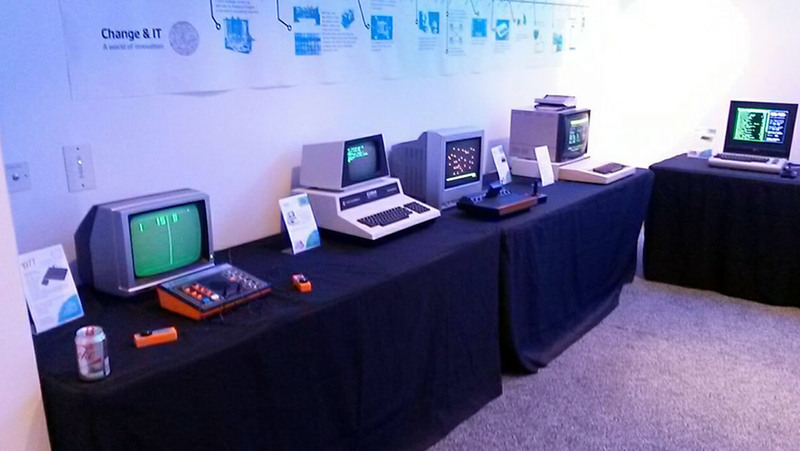 The display is a fantastic way to break the ice with attendees discussing the first games they used to play and the first console or computer they ever had. It demonstrates just how much computing has developed over the past 40 years and attendees can draw comparisons between the computers in the display and the computers in their pockets in the form of mobile phones! These pictures were taken at a corporate event for Standard Life in 2015. Past clients for our retro gaming corporate events include Gadget Show Live, The Business of Software, Microsoft Research, BBC Learning and Butlins.